This is a short follow-up article to "Sculpting Female Figures" which I did for this site a while back. In this case, I've documented a specific figure sculpt, which some will hopefully find helpful if they want to embark upon figure sculpting. Again, as with all my figures, the scale is 1/6 and the medium is epoxy putty. 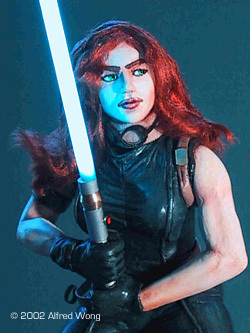 Mara Jade is probably my favorite sci-fi character, and since my original Mara was one of my very first sculpts, I knew I could do her more justice as my sculpting skills have improved quite a lot since then. The first thing I had to do was to carefully remove the microflorescent tube used for the lightsaber from the original Mara. I didn't have any more and did not want to fork out for new ones. 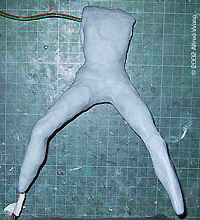 The next step was to make a rough core of the figure with inexpensive plumbers' putty. As I stated in my original article, I use plumbers' putty for the core of the torso and legs. It is cheap, and dries rock-hard very fast. Even at this early stage, it is important to make sure the basic pose and anatomical structure is correct. Since the plumbers' putty is very hard, it is hard to change afterwards if something is drastically wrong. 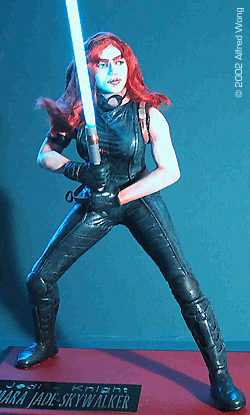 Notice that the wire for the lightsaber lighting is already embedded in the putty, running from one leg up to one arm. The next and most important thing to do was the head. The face is sculpted from the excellent "MagicSculp" putty (I talked about this stuff from the original article), which is just a fabulous product…it really IS magic! The rest of the head is simple plumbers' putty again. But again, the shape of the head needs to be right, even though it will be covered with hair. The "MagicSculp" is then used to coat the torso and legs core, and the details worked into that top coat. 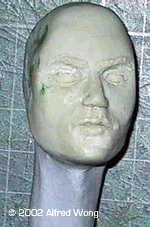 The head is painted and totally finished separately. At right, the "kit" of the figure is ready to go. 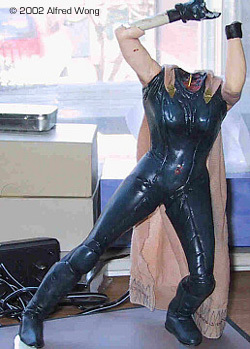 The right arm, body and legs are in one piece finished with "MagicSculp", with the head and left arm as separate attachments. The right arm is part of the body because it carries the wire for the lightsaber. Once the parts are painted and assembled, the lightsaber is made from styrene tubes, and the "blade" is a dyed styrene tube fitting over the microflorescent light. The wiring does require some sacrifices in accuracy as far as the actual handle of the saber goes, but I feel the effect of lit blade is worth it, as can be seen in the pics of the finished figure. This page copyright © 2002 Starship Modeler. Last updated on 8 May 2002.